Drivers of General Motors (GM) vehicles with OnStar can soon get doughnut discounts with their directions to Dunkin' Donuts (DNKN). The automaker's new "AtYourService" program will beam retail coupons to drivers who ask OnStar for directions to participating retailers. The program rolls out in early 2015 in the U.S. and Canada where OnStar -- GM's subscription service that connects drivers to operators -- annually receives 35 million requests for directions and assistance. To make coupon connections between drivers and their destinations, OnStar will use the digital coupon providers RetailMeNot and Entertainment Book. Drivers can also book a hotel reservation through OnStar's new partnership with Priceline.com (PCLN). 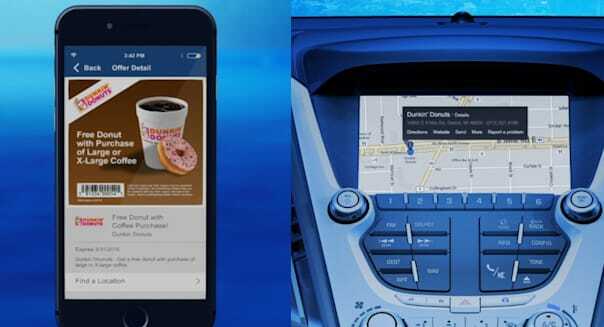 "We can't think of a more exciting and targeted way to connect with our guests than when they are in their vehicles looking for a Dunkin' Donuts restaurant," said GM vice president Scott Hudler in a statement. "We'll bring value to GM drivers while driving those consumers to our stores with instant incentives."